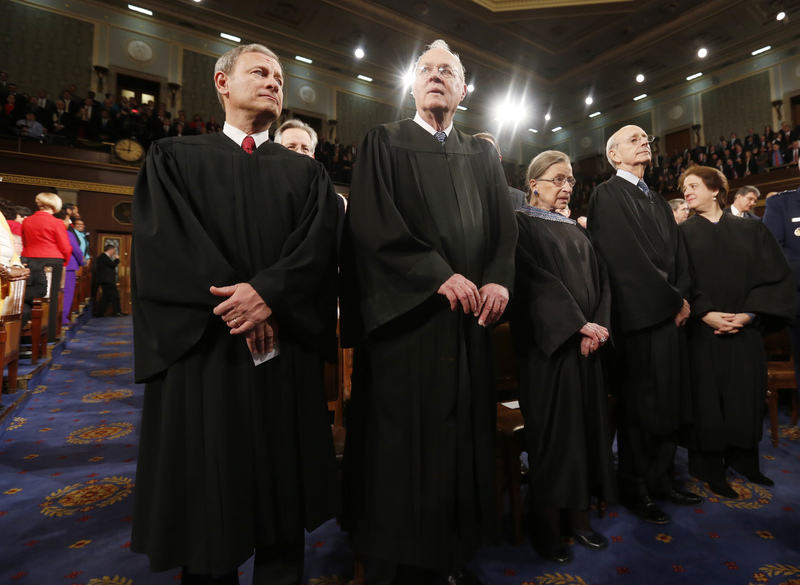 The U.S. Supreme Court began hearing arguments on Wednesday in the monumental healthcare case King v. Burwell. The lawsuit, which alleges that citizens who live in regions without state-established healthcare exchanges are unfairly subject to higher penalty fees and insurance costs, has been in litigation since 2013. An official SCOTUS ruling is expected by midsummer, but already, many outlets are predicting probable outcomes. Despite its potential to rock the American healthcare system, broken down to an elemental level, the current challenge to the Affordable Care Act is really just an elaborate argument over wording — and it's not too difficult to guess how SCOTUS will vote on King v. Burwell. The Associated Press reported on Wednesday that the case is already "sharply divided" along the usual lines, although Chief Justice John Roberts, who had originally voted to uphold the bill in 2012, remained unusually silent throughout most of today's hearing. Although both Roberts and Justice Anthony M. Kennedy are currently believed to be wildcards, the remainder of the SCOTUS bench fell largely in line with their past rulings and records. If the political forecasters have it correct, the government would only have to secure one of the wildcard votes — Roberts or Kennedy — to win the case. The plaintiffs, however, would need to win both, says the AP. We don’t look at four words. We look at the whole text, the particular context, the more general context, [and we] try to make everything harmonious with everything else. Breyer agreed, adding that to "go into the context" itself would necessarily weaken the argument posed by the challengers. According to court documents, Ginsburg began the morning by not only questioning the validity of the case, but the eligibility of the plaintiffs themselves. Specifically, Ginsburg pointed out, the two male plaintiffs in the case were Vietnam veterans, leading many to question whether they had any real stake in the case at all. Ginsburg also indicated that the likelihood that legislators had purposefully set out to create language that would bar millions from receiving subsidies was low, as the resulting chaos would be "disastrous," reported the AP. Sotomayor questioned Michael A. Carvin, the plaintiffs' legal representation, on whether he realized that if the challenge to the Affordable Care Act succeeded, it would also prompt "the death spiral that this system was enacted to avoid." According to the Times, on the flip side of the court, both Justice Antonin Scalia and Justice Samuel Alito were "consistently critical" of the Obama administration's position. Scalia insisted that the law "means what it says," despite the "disastrous consequences," adding, "How can the federal government establish a state exchange? That is gobbledygook." He also questioned the veracity of Congress doing nothing, should the law be repealed. Alito further argued that the states themselves could step in to enact their own exchanges if the the Act were trashed. "It’s not too late for a state to establish an exchange if we were to adopt petitioners’ interpretation of the statute," Alito said. "So going forward, there would be no harm." Solicitor General Donald Verrilli Jr. claimed that there simply wouldn't be enough time, no matter whether the SCOTUS ruling was delayed or not. It seems to me ... that if the Internal Revenue Service is going to allow deductions using these [subsidies] that it has to be very, very clear. And it ­­seems to me a little odd that the director of Internal Revenue didn't identify this problem, if it's ambiguous, and advise Congress it was. So far, the vote seems split directly down the same lines as previous partisan issues. The two to watch in coming days, of course, will be both Kennedy and Roberts, but until the official June ruling is handed down, nothing remains perfectly certain.